Gardman 7622 Walk-In Greenhouse with Shelving. Give your seeds, seedlings, and young plants an early start in this roomy greenhouse. Strong powder-coated tubular steel frame with simple push-fit assembly that requires no tools. Compact size is ideal especially for small backyards or homes where space is an issue. Quality construction and materials will last many seasons. Features a heavy duty reinforced polyethylene cover and roll-up zippered door for easy access. Designed with large usable space on one side and shelving on the other. Two-tier shelving unit included: powder coated tubular steel frame with metal grid shelves. Includes guy ropes, and metal stakes for extra stability against high winds. Simply insert metal stakes into ground through pre-installed metal grommets in polyethylene cover. Easy to follow assembly instructions. Dimensions: 75" Long x 49" Wide x 75" High. 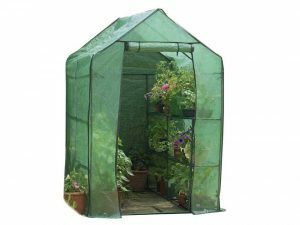 Gardman "Bring your garden to life"
- Roomy walk-in greenhouse complete with 2-tier shelving unit included. - Ideal for giving seeds, seedlings, and young plants an early start. - Reinforced polyethylene cover and roll-up zippered door for easy access. - 75" Long x 49" Wide x 75" High.